My husband and I have a baby, a 1967 Dodge Coronet RT. The restoration project began as our youngest children were in their teens and as the reality of a little more time on our hands moved closer. Thinking about cruising in our Mopar was the saving grace as we stared ahead to an empty nest. Through the restoration process, we envisioned long drives on sunny summer weekends; in this scenario just the two of us didn't seem so bad. We thought, too, about hanging out with other classic car buffs at shows and cruises night. Time passed, the teenagers left home for college, and still my guy plugged away at his new hobby. With real life and a real job getting in the way it took a decade before we finally got our baby up and running. The do say all good things are worth waiting for and I think the fact that it took him far longer to complete than he thought has only made the end result that much more pleasant. Though real life still tends to get in the way, we have for the past five summers spent as many weekends that we can doing what we had seen ourselves doing oh, those many years ago. This past one was no exception as there was a cruise night Friday, and car shows Saturday and Sunday. It might not be everyone's cup of tea, but for this girl who came of age when muscle cars ruled, it's awesome. 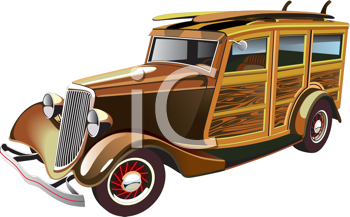 So for all the vintage, antique and classic car lovers out there, here are some fun illustrations. Maybe you'll find a favourite among them.